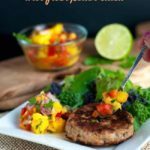 Heat up the grill and relax with this easy meal of Chipotle Chicken Burgers with Fresh Peach Salsa. Great for lazy summer days or for busy week nights! 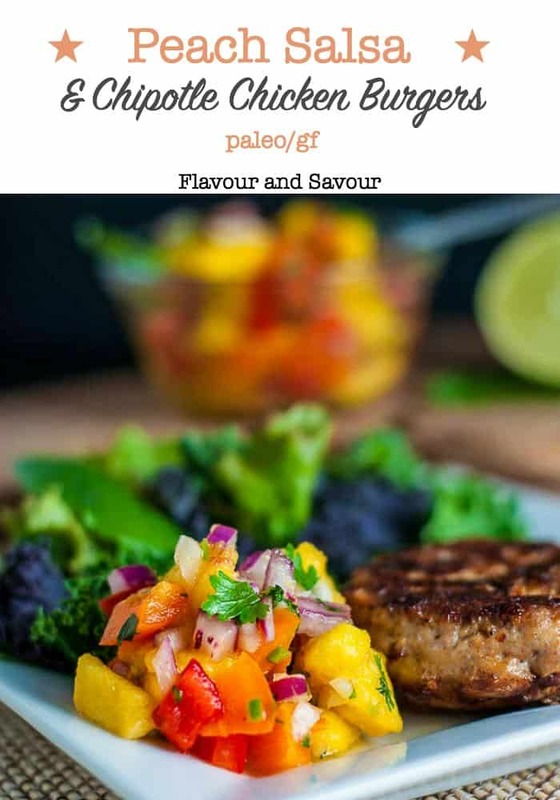 After making these healthy Open-Face Thai Chicken Burgers and finding that a burger is just as satisfying without a bun, I decided to experiment a little with flavours and made these Chipotle Chicken Burgers with Fresh Peach Salsa. 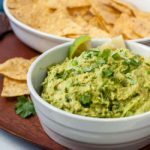 Even the word “chipotle” conjures up images of hot, smoky and spicy food. 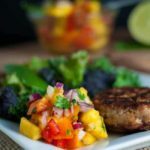 You can easily control the heat in these burgers by increasing or decreasing the amount of chipotle peppers you add, or by only using the adobo sauce. Make them mild, medium or spicy hot! Chipotle peppers are smoked jalapeños. I often find I only need part of a small can of chipotle peppers in adobo sauce, so I store the remainder in a small glass jar in the fridge for another day. They last for a few weeks or more. Heat and Sweet! 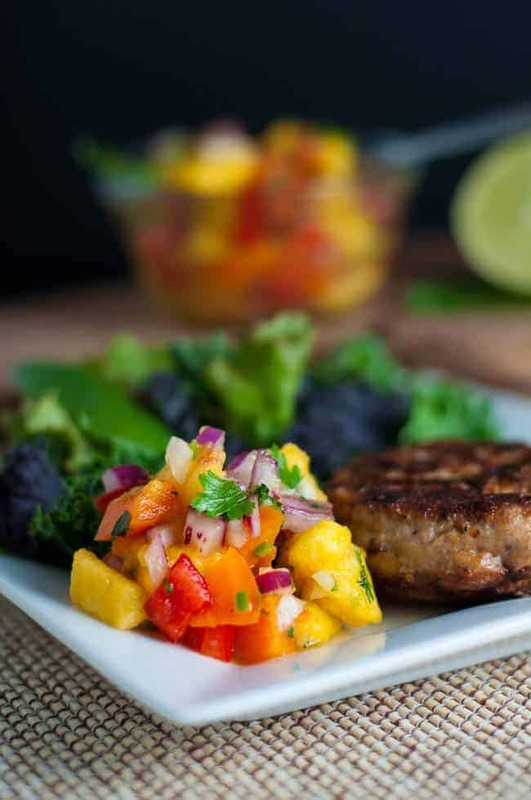 These burgers are delicious with Peach Salsa! 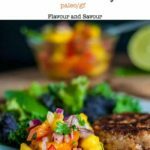 Form the mixture into large patties for dinner, small ones for kids or for lunches, or even into meatballs to tuck inside a wrap. Top with a dollop of fresh peach salsa. 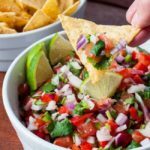 This fresh salsa is colourful, it’s sweet with a little heat, and it perfectly complements the spicy chipotle flavour of the burgers. Best of all, it’s quick to prepare. Isn’t it funny how old habits stick with you? For many years, the last few weeks of August was a time for frantic preparation. When I was young, the first week of September signalled a return to school or to university. In later years, I was busy getting my kids ready for back-to-school time, and for many years, as a teacher myself, I was preparing classroom activities. 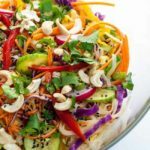 And on top of it all, I was filling my freezer with make-ahead meals and grab-and-go lunch time snacks. Now that I’m no longer teaching and my kids are grown, I don’t need to do that any more. September is just like any other month. But for some crazy reason, I still do it! I feel this sense of urgency that the first of September is just around the corner and that I need to be prepared for it. I find having a well-stocked freezer full of quick-to-make dinners suits my new lifestyle, which seems just as busy as when my children were young and I was working full-time outside the home. Can I freeze these Chipotle Chicken Burgers? Absolutely! Mix up the ingredients for the burgers, form into patties, freeze on a baking sheet, then stack between layers of parchment paper. They’ll be ready for one of those hectic nights when you’re arriving home late and everyone’s hungry. Dinner problem solved! Serve with a large spoonful of Fresh Peach Salsa. This fresh peach salsa is also good made with nectarines. 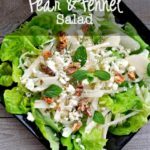 It's great served with chicken or turkey burgers or with salmon or halibut. Combine all ingredients in a medium bowl. Cover and refrigerate for 30 minutes before serving. 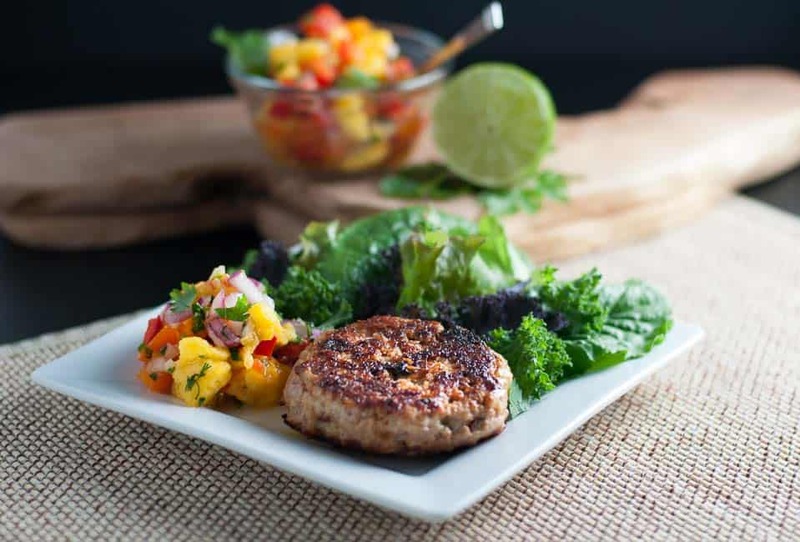 These Chipotle Chicken Burgers are also great served with Pineapple Jicama Salad. Thanks, Jane! I’m loving summertime–it’s always been my favourite season, and this year is no exception! I don’t miss hamburger buns either, I actually like my burgers without better which is really saying something considering bread used to be my main food group! 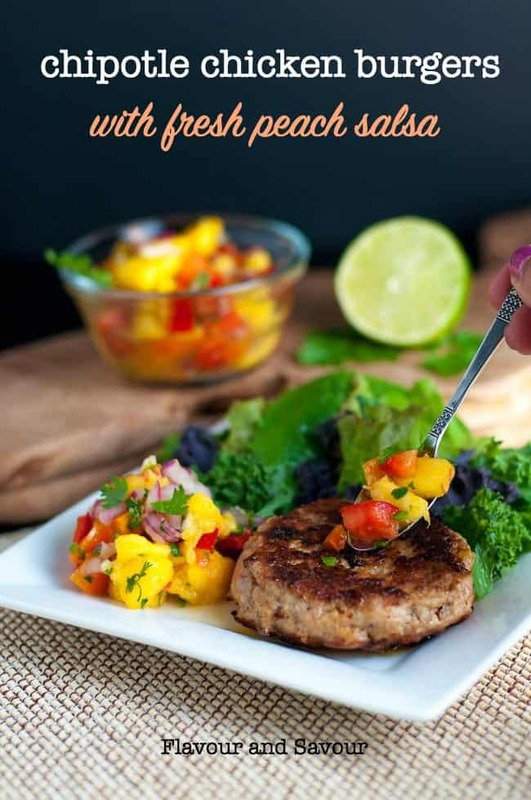 I love this summery burger you’ve put together, and I have a dozen ripe peaches right now, so this is perfect timing! I know what you mean! Losing the bun means there’s room on the plate for so many more healthy choices!